Amir Khan has found an unlikely supporter in the form of former undisputed heavyweight champion Mike Tyson. The British boxer s currently training with coach Virgil Hunter at his Bay Area gym as he prepares to challenge WBO welterweight champion Terence Crawford this Saturday. “Mike is a lovely guy, one of those guys who tries to give advice to everybody,” said Khan to the Mirror after meeting with Tyson a couple of weeks ago. 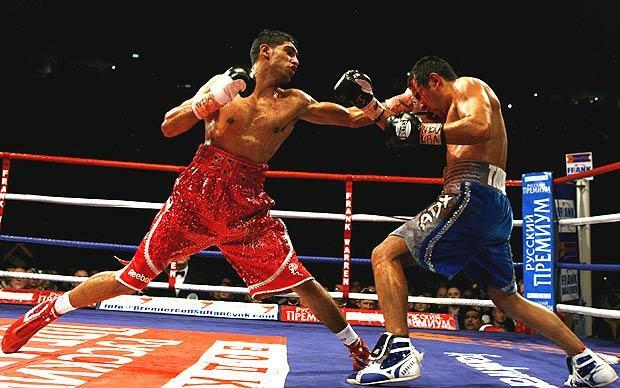 The 32-year-old Khan is adamant that he has faced the better competition than the undefeated American world champion. “Crawford is a great fighter but I just feel that, technically, I have faced better fighters than he has,” Khan said. “He has fought Yuriorkis Gamboa, he was a very good fighter, very quick. But I don’t think he has ever fought anyone like me. Khan still hasn’t given up on fighting his old sparring partner from the Wild Card in Hollywood. “Manny Pacquiao would be an amazing fight and one I have always wanted. That is the fight I would love,” Khan said.